TUBING: Tube 1/16" to 1/2" O.D. Pipe Thread 1/16" to 3/8" N.P.T.F. Brass bodies and nuts. Acetal copolymer (Celcon®) or brass sleeves. 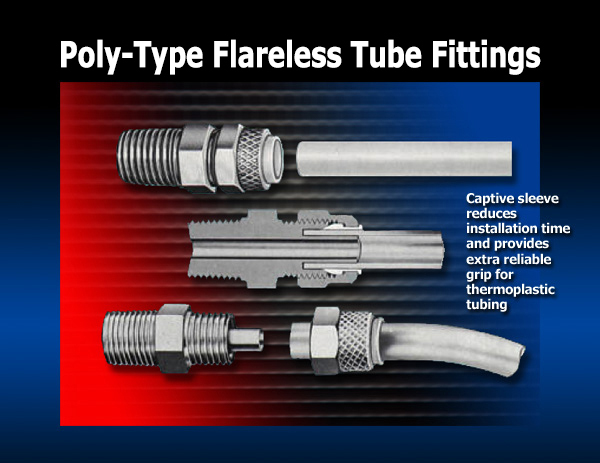 Poly-Type Fittings offer a minimum of 36% saving in installation time, compared to regular compression type fittings, or ordinary fittings for plastic tubing- a minimum of 77% saving compared to flare fittings. To assemble the New Poly-Type Fitting, just push tubing into fitting and tighten the nut. There is no need to disassemble - no fumbling for a loose sleeve. This new fitting has a plastic sleeve which snaps into the nut. The complete unit-body, nut and sleeve - is furnished assembled, ready for installation. When used with Poly-Type, PVC or EVA Tubing, fitting is assembled finger tight - no wrenches needed. These studies made under shop	conditions. While actual time might vary depending on field conditions, the relationship between time values should remain constant. No wrenches, flaring tools, benders or other tools are used for installation. Tubing is cut to length with a knife, tubing cutter or shears. It is flexible, bends readily by hand. Plastic tube racks and bend holders are available for holding tubing in position. The Poly-Type Fitting when assembled finger tight on Poly-Type or PVC Tubing will hold the burst pressure of the tubing itself. The nut revolves around the sleeve as it is tightened, preventing twisting and weakening of the plastic tubing. Poly-Type fittings are used with plastic or soft metal tubing for pneumatic instrumentation circuits and applications with other gases and liquids. Acetyl copolymer sleeves, for use with Poly-Type, PVC or EVA tubing, are furnished with PoIy-Type fitting sizes of ¼" through ½" O.D. Universal brass sleeve and nut assemblies, for use with lmpolene and Nylon tubing and soft metal tubing, are also available for these sizes, and are furnished as standard with 1/16", ½" and 3/16" sizes. The versatile brass nut (half-knurl, half-hex) with plastic sleeve is easily and quickly finger tightened on PoIy-Type, PVC and EVA tubing. The hex portion permits wrench tightening (1 turn after fingertight). Wrench tightening is recommended for all applications where brass sleeves are used, and is desirable whenever service conditions require the full pressure capability of the tubing. 5/16", 3/8", 1/2" 0 D - .049"
A three piece tube fitting, furnished assembled with nuts and sleeves. Elbows and Tees: Brass Forgings. Connectors, Unions, Nuts: S.A.E. CA360 or equal. Plastic Sleeves: Acetal copolymer (Celcon®). Long length Dryseal American (National) Standard Taper pipe threads. To order, simply specify catalog number for configuration and size desired.